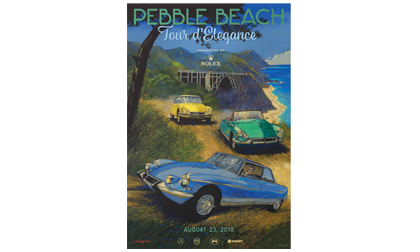 PEBBLE BEACH, Calif. – August 6, 2018 – Automotive Fine Arts Society (AFAS) member Barry Rowe has been commissioned to create the official poster for the 2018 Pebble Beach Tour d’Elegance. Rowe’s artwork features three variants of Citroen’s DS 19 and will be used for the Tour poster, while the original piece will be shown in the AFAS exhibit on the greens. Sponsored by The Lincoln Motor Company, the AFAS show will take place on Sunday, August 26, 2018, at the 18th fairway of Pebble Beach Golf Links. Although Citroen and its DS were only minor footnotes in America’s mid-century automotive scene, the DS – introduced in the fall of 1955 and produced through spring 1975 – created a sensation at the time of its launch. In a postwar period bracketed by the Iron Curtain and space race, Citroen’s DS spoke to the upside of advanced technologies – it was the first production car to incorporate disc brakes, while advancing the development of hydropneumatic suspension – as well as France’s unique position within Western Europe. If one could liken it to any production car today, it would be Tesla’s Model S.
An English native, Rowe studied graphic design at the Coventry School of Art and Design. From there, he worked as an art director in the advertising field before pursuing his passion for painting automotive artwork, becoming a freelance artist in 1966. His career was jumpstarted as the recipient of the Sotheby’s Art Award for his portrait of Argentinian champion Juan Fangio. This led to commissions from Louis Vuitton of Paris, Royal Mail, Royal Doulton and Royal Caribbean Cruise Lines. As well as his many poster commissions, Rowe has captured ten “Awards of Excellence” and the “Lincoln Award” in 2006 at the annual AFAS exhibit during the Pebble Beach Concours. In addition to his automotive art, Rowe is an avid enthusiast. Growing up near the Jaguar factory, Barry would ride his bicycle to watch Jaguar’s ‘C-Type’ and – later – ‘D-Type’ racecars under construction. And as an avid F1 and vintage racing fan, Rowe travels to famous venues each year. Of those collectible cars he’s owned, Barry’s favorites are a 1931 supercharged Lagonda, a 1929 Riley Nine Tourer and a more modern – if that’s the word! – Morgan. He currently resides on the southwest coast of England’s Devon County, known for its sandy shores and beautiful coastlines. Original pieces from Rowe’s distinguished career can also be enjoyed in the gold-medal, award-winning book, “Atmosphere and Light: The Paintings of Barry Rowe.” More information about Barry Rowe and his artwork can be found at www.barryrowe.com.